Greetings! I’m Ann Emery from Innovation Network in Washington, DC. I blog about my adventures as a nonprofit and foundations evaluator. I share data files and preliminary results from research projects, like this evaluation use survey. I’ve collected guest posts from more than 15 colleagues. I’ve created more than 30 video tutorials, Excel for Evaluators. Posts that share resources – Check out my bank of focus group questions. Posts that provide career advice – I shared resources for job-hunting evaluators and conference tips for newbie evaluators. Posts that start conversations – Here’s an example: Should evaluators share statistical results during evaluation conferences? Posts that entertain – Check out my countdown to the AEA conference and Chris Lysy’s guest cartoon about tattoos for evaluators. Posts that tell stories – And then he flashed a slide that made the whole room gasp… by Jen Hamilton is the most popular guest post. Jen tells a presentation horror story – and how the evaluator turned it around. Lessons Learned – what I’ve learned: Want to write a great blog post? The best posts are short and sweet (not a full manifesto); contain photos, graphs, links, or embedded videos; and end with discussion questions so readers can respond with their own ideas. Lessons Learned – why I blog: My reasons have evolved over time. I was initially inspired by Chris Lysy’s Ignite presentation about why evaluators should blog and the 2011 Bloggers Series on aea365. And, I simply needed more space – I couldn’t fully express myself in 140-character tweets @AnnKEmery any longer! Now, I blog to educate other evaluators (through my tutorials) and to educate myself (by collecting guest posts from different viewpoints). Lessons Learned – why you should blog: Blogging makes you a better communicator (and, therefore, a better evaluator). I’ve also talked to evaluators whose blogs have led to invitations to write magazine articles, join committees, participate in podcasts, speak on panels, and turn their blog posts into a published book. Who knew that 400 words could open so many doors? Lessons Learned – hesitant to start blogging? Most evaluators are concerned that blogging will be time-consuming. So, I conducted some super-serious research to test this hypothesis. 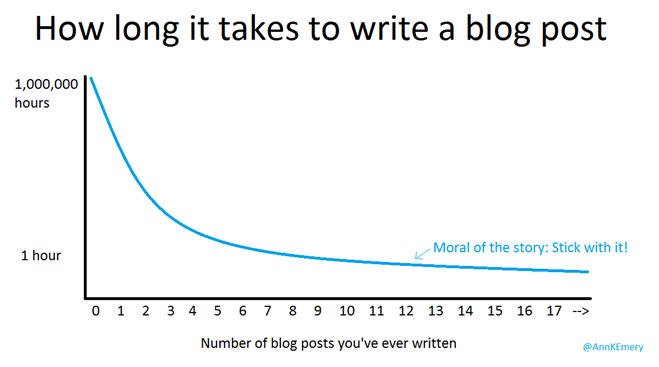 Results indicate that, yes, it takes one million hours to write your first blog post. But, with practice, you’ll be writing blog posts in an hour or less. Stick with it! I like all your videos on excel. I wold be happy If you can advice me more on dashboards on excel and word. I can not get the chance to learn more that because I am far in one of the poorest Africa.